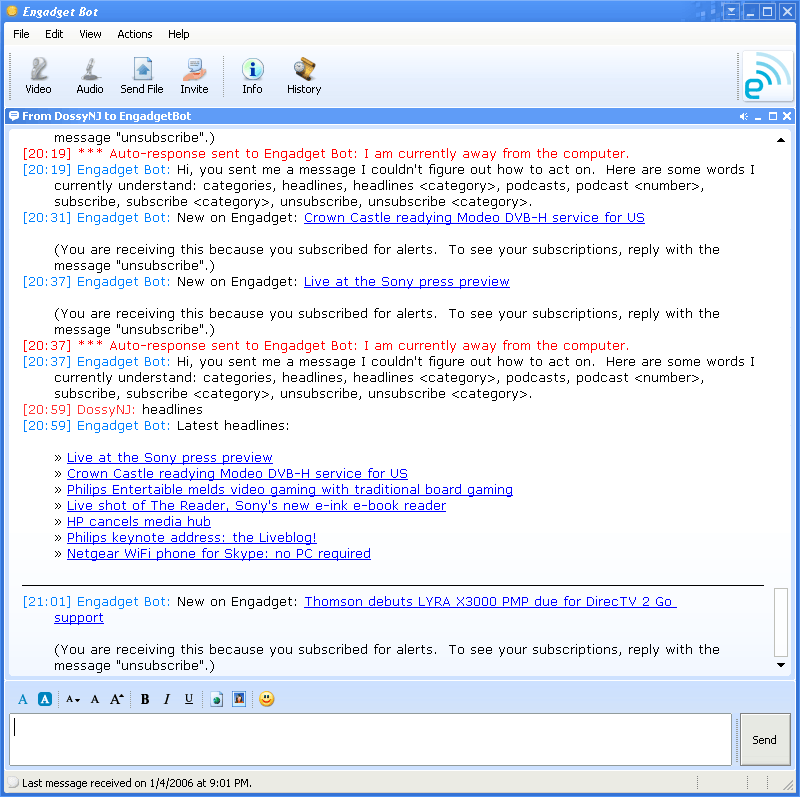 The Engadget Bot … it’s ALIIIIIIVE! Okay, I’ve been sitting on my hands for a day or two, itching to say something about this … but I resisted until Jason let the cat out of the bag, first. I consider this a mental health project, something I could hack on for fun. 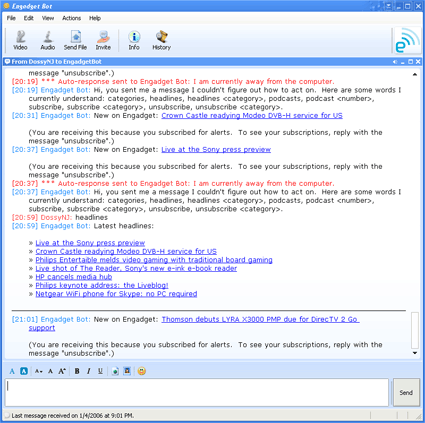 So, when he asked about an Engadget AIM Bot back on December 29, I decided to start hacking on it. Four days later, at the end of my New Years vacation on January 2, it was up and running and mostly functional. For folks who aren’t sure what I’m talking about, let me back up a step. Engadget is a gadget blog that is part of the Weblogs, Inc. Network. A number of people contribute articles to it, covering all sorts of news about gadgets and technology. Traditionally, you might subscribe to its syndication feeds through an aggregator and keep track of updates to the site that way. But, what if notification of updates could be pushed to you via instant messaging instead? That’s one of the things the Engadget Bot does — it allows you to subscribe to any number of categories at Engadget and receive IM alerts when new entries are posted to those categories. For example, there’s lots of new entries being posted in the CES category because the CES tradeshow is going on right now in Vegas. To subscribe, you’d would send an IM to the screenname EngadgetBot with the message subscribe ces. Also, it seems that the bot has trouble sending IMs back to you if you don’t have it on your Buddy List, so it might be a good idea to add it to your Buddy List first. For the geeks in the audience, the Engadget Bot is written in Tcl … roughly 2,000 lines at this moment. For persistent data storage, I opted to use the light-weight SQLite 3, which has a really convenient Tcl binding. The source for the bot isn’t available, but it might be someday. A lot of it has to do with the fact that the code is embarassingly simple and I’d honestly be embarassed to have folks looking at it until I can clean it up and make it presentable. Anyway, I really enjoyed hacking on this and feel really proud to have gotten it working. It’s very simple, but I think it’s already very useful if you’re interested in Engadget’s content and keeping up to date. I get to build something really simple because all the hard stuff — feed syndication of Engadget content, the AIM messaging network, etc. — are already all in place. This is just another example of what Web 2.0 mash-ups can enable folks to build. UPDATE: My friend Og Maciel just blogged about the bot after I told him about it. Considering he’s on the Ubuntu team doing the translation to Brazilian Portuguese, it’s only natural that his entry is in Portugese. Way cool! One of the things that attracted me to programming was the prospect that you could create something that could be used (and usefull) to many! Watching you work on your project, live, last night gave me that thrill! Congrats to a great job! Og: thanks! I really appreciate the interest you showed in it and the help getting the word out. We’ll definitely have to get together again soon.